1. People friendly and safe – This device can be used during regular business hours while personnel are working in the area. 2. Speed – We estimate that our radar unit is about 50% faster than traditional radiography methods. 3. Hard copy for proof – We can print radar images of sub-surface inclusions on-site, burn images to a CD, or send them via direct mail or e-mail for future reference. 4. Accurate depth determination – Without a doubt, the most accurate method for determining the depth of sub-surface inclusions. This is a must when setting anchor bolts in a post tension slab. 5. New radar inspection hardware. The benefit of this machine is that it has a second sensor built in that can detect energized 50/60 hertz electrical lines. 6. 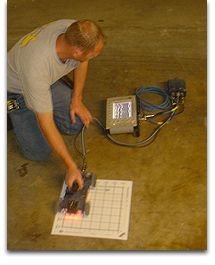 Our radar systems can scan up to 18” deep in concrete.